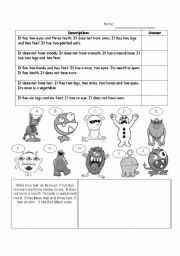 I use this worksheet to evaluate grade 3 students´ ability to reinvest understanding of text. Two Parts. Part 1: read and match. Part 2: draw the monster as requested. 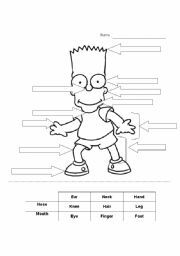 Label Bart Simpson; a good way to review body parts with ESL students. Do you have ... ?? This is an activity to practice asking questions in the ESL classroom. Students must find someone who has something in particular. If you want, have them pick the number of the question in a fish bowl. They speak English ... and French is not allowed. Project for 5th graders. They must pick a country (please create an original list)and find information about an animal in this foreign country. They create a poster with specific pieces of information and they present it to the other students. 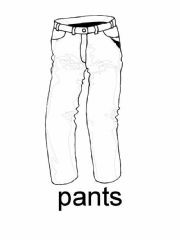 Vocabulary related to clothes. Print the pages and use them as flashcards.